This is the third new recording of the symphony to come my way in the last few months and since there is hardly any shortage of good versions a clear first choice is not easy to pick. Newcomers to the symphony are advised to read the review of the Wigglesworth (BIS) and Kofman (Dabringhaus und Grimm) (http://www.musicweb-international.com/classrev/2006/Sept06/Shostakovich13_BISSACD1543_MDG93712056.htm) recordings to find the pros and cons of them as well as background information about the work itself. There could be a historical reason to record Babi Yar in Liverpool, since it was here that the first performance in Western Europe was given on 14 September 1971 with the RLPO under Sir Charles Groves and with John Shirley-Quirk as the bass soloist. I can�t believe there were many, if any, musicians from that performance still playing in 2003, but that is of no great importance. What matters is that the RLPO has retained its excellence and under its then principal conductor Gerard Schwarz, who took over in 2001, seems to be in very good shape in all departments. They certainly produce a homogenous sound and lots of power. At the other end of the dynamic scale, their hushed pianissimo, so important in this symphony, is just as impressive; listen to the softly intense playing of the final pages. The production team have ensured that the orchestra is expertly recorded with wide-ranging dynamics. Listeners should be warned that the bass drum makes its mark ca.10.00 into the first movement with such thundering realism that those who are unprepared will be literally lifted from the chair. With an excellent contribution from the male voices of the Royal Liverpool Philharmonic Choir, Schwarz has the best possible conditions for making something memorable of this dark masterpiece and on the whole he manages this with flying colours. The only problem � and the only reason for not giving a straightforward recommendation � is that there are so many other splendid versions available. Even if I reduce the competition to the ones mentioned above, there are swings and roundabouts. The other two are in SACD, which of course can be a deciding factor for those with multi-channel equipment, while the present one is in normal digital. Making some comparisons, mainly with the Wigglesworth version, which in the end was my recommendation, Schwarz goes for sharper contrasts in tempo. While the differences in the first movement are marginal, Schwarz gains a full minute in the Allegretto second movement, which he loses plus another 20 seconds in the Adagio and a further good half-minute in the Largo. In the final movement they are again more even. Taken on its own Schwarz�s reading is fully valid with admirable dynamic gradations and pin-point precision. His second movement dances along with a lightness and forward thrust that is absolutely compelling. I can�t remember hearing it played with such verve and this movement alone makes the recording highly desirable. The rest of the symphony is not quite on the same level, the marginally slower speeds in the Adagio and Largo movements imply a certain loss of tension as compared to Wigglesworth. But make no mistake: we are speaking of subtle differences now. Without the direct comparisons I would have been fully satisfied with Schwarz. Moreover he has a real trump card in his soloist. I greatly admired Jan-Hendrik Rootering on the Wigglesworth recording, and still do. He sings with power, expressiveness and involvement but Gidon Saks has an even greater intensity and he has the finer voice. Rootering�s is slightly worn and drier of tone while Saks is rounder, warmer, more beautiful and he has a far wider range of tonal colours. There is also an inborn quality in his voice which, for want of a better expression, could be termed Russian "sentiment". As opposed to "sentimentality" this is, in my vocabulary, a downright positive denomination and it is very aptly demonstrated ca. 7 minutes into the first movement where he scales down his impressive voice to ravishing lyrical beauty. In the second movement he adjusts himself to the lightness of Schwarz�s reading and adopts an almost tenor-like tone. All through the symphony he sings with such tangible involvement and soaring beauty that one time and again nods and says: "This can�t be bettered". There are so many memorable moments, but just to pick one: in the bleak fourth movement, Fears, where Yevtushenko lists the many fears that surrounded the Russian people, "the fear of speaking to foreigners � even to your own wife! ", Saks� voice is so charged with emotion that he could be speaking out of personal experience. That movement - indeed the whole symphony - is music that grows on you with every hearing. Readers who have not yet made the acquaintance of Babi Yar are advised to attend to this deficiency without delay. Even if in the last resort I still have a slight predilection for Wigglesworth thanks to the overall greater intensity and the fabulous playing of the Netherlands Radio PO, any of the three versions mentioned here is a worthy intermediary of Yevtushenko�s and Shostakovich�s touching message. 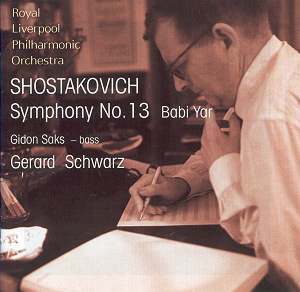 For the deeply felt singing of Gidon Saks the present version should be heard and savoured by anyone with a liking for this symphony, irrespective of how many other recordings one already has. As with the other two versions the documentation is splendid as are the liner notes by David Fanning and the anonymous ones about the poet and the artists. Full texts, transliterated and translated by Andrew Huth are also included. A model of presentation, but why did we have to wait more than three years for its release?